You could chalk it up to youth. You could chalk it up to overconfidence. You might even blame the sheer number of injuries. 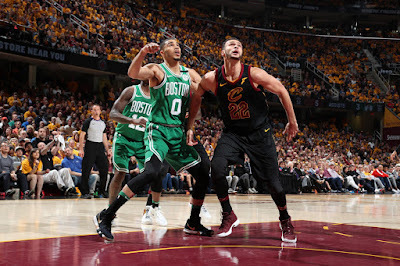 None of those things are to blame for the Boston Celtics losing Game Three of the Eastern Conference Finals to the Cleveland Cavaliers. Jaylen Brown thinks they did "a little bit of everything" wrong, Jayson Tatum thinks the Cavs were the "more organized and focused team" - and Terry Rozier just thought Boston needed to "get their butts whipped". Now holding a one-game lead in a best-of-seven series, the Cs will need to fix the collective issues highlighted by these young players - watch the videos below to hear their full assessment, and how they plan on responding.